The Massey Area Museum welcomes donations from generous community members and business owners. Whether you donate $5 or $250, your support will help us develop our programs and services. 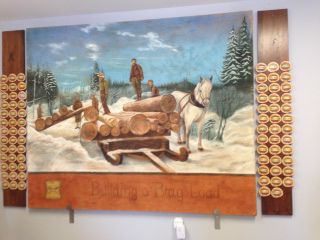 The mural you see to the left is used to honor donations larger than $250 to the Museum. Those who donate more than $250 get a log next to the mural. You can have the log in your name, have the log in memory of a loved one, or name them for their descendants. The mural itself is a chalk painting done by Edgar Muller during the 2004 Massey Street Painting Festival. It took 2 days to complete, and was done on his hands and knees. The mural is called "Building a Brag Load." A brag load is a load of logs that was intended to set a record or be something to "brag" about.